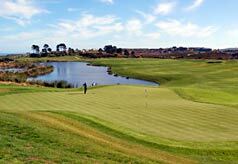 Great location, good value for money - and discount golf at Pezula & Simola. 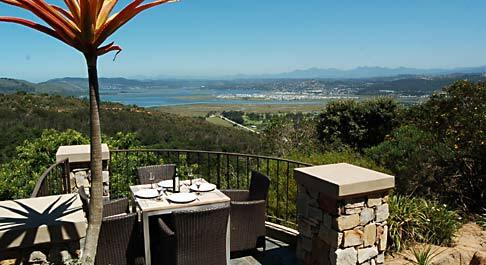 Occupying a prime position above the Knysna lagoon, Eagles Nest Apartment offers comfort and convenience and is ideal for 2 couples or a family. Located on the exclusive Pezula golf estate, the property is arranged on 2 floors and enjoys a high level of privacy and security  as well as easy access to Knysnas beaches, restaurants, shops and visitor attractions. The views over the lagoon from the verandah are simply stunning and the braai/entertainment area (with its rock pool and slide) will keep adults and children happy for hours. The owners corporate membership at both Pezula & Simola Golf Clubs offers a big advantage to guests  reserved tee-times and greatly reduced green fees at both courses. 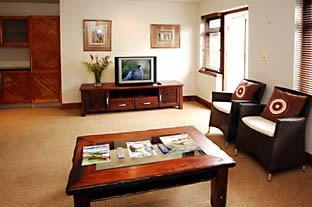 Eagles Nest Apartment sleeps up to 6 people in 1 double bedroom and 1 twin room on the upper floor, plus a double sleeper couch in the ground floor lounge area. The upstairs bedrooms share a spacious shower room/WC. 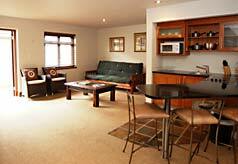 The lounge area is furnished with a sofa/sleeper couch, armchairs, coffee table and TV with all DSTV channels. The modern, open-plan kitchen/diner is well equipped with electric hob, microwave, fridge, sink, kettle, toaster, etc. plus ample crockery, cutlery and cooking utensils. Offering superb lagoon and mountain views, the huge verandah (with patio furniture) is the ideal place to soak up the sun, enjoy a dip the attractive rock pool and braai in the evenings. The apartment offers secure parking for up to 2 vehicles in its paved courtyard. Greatly reduced green fees at both Pezula and Simola. Play often enough during your stay and the money you save could cover your apartment rental!